We’re having some downtime here in the Salton Sea so I decided to shoot a little video about our ClikStand Stove. 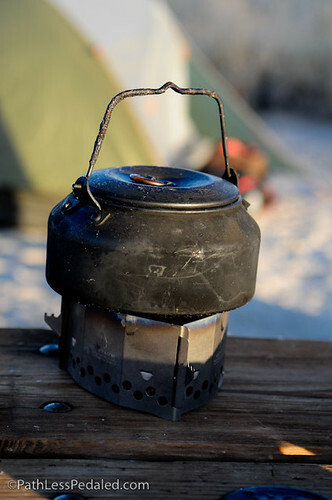 It’s an amazing lightweight and super stable base for your Trangia or Esbit stoves. In the video, I’m lighting the stove with a firesteel and some may wonder why. It is the most reliable way to light an alcohol stove. You won’t find yourself with an empty lighter and it works even when wet! As a side note, I also decided to shoot, edit and upload the video with just the iPhone! I’m using a mini articulating directional mic on the iphone and am using the ReelDirector app to edit the video, add titles and transitions and upload to YouTube – how’s that for geeky?! You guys should create an Amazon store using Amazon Associates where you get 10% of whatever you sell there. I’m headed over to your link for this stove to maybe buy it. Check it out, (https://affiliate-program.amazon.com). Just ordered the Cascade set, no more jet engine on our trips!